One of the Offa bloody robbery suspects has been arrested by the police after he reportedly sneaked into a hotel in Kwara. A report earlier by the Kwarareporters has shown that a serving policeman identified simply as Isiaka (surname withheld) is among the principal suspects being held for the Offa robbery in Kwara State on April 5. It was learnt that the suspect, who is a native of Ilorin, the state capital, is a sergeant and was among the first set of suspects arrested over the incident and had remained in detention since then. 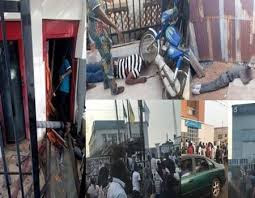 “He is among the eight people that have now been confirmed to have more to say over the robbery, out of the initial 12 that were arrested around Offa and Ilorin. You will recall that eight suspects were initially arrested and in line with our mandate, we profiled them so as to ascertain the level of involvement of each suspect. “So far, we have every reason to believe he has more to tell us beyond what he had said. It is for this reason we are still keeping him,” the source said yesterday. Meanwhile, the former police constable, Michael Adikwu, who was arrested over the bloody incident in had actually vowed to kill many policemen, following his dismissal from the state command. Sources within the command who were familiar with his case revealed during the week that Adikwu was actually on a revenge mission over his dismissal, a probable reason for the high number of policemen that were killed during the operation. Nine policemen were among the about 30 victims of the robberry, which shook the entire nation over its barbaric execution. Adikwu had been dismissed after an orderly room trial found him guilty of complicity in the escape of some robbery suspects from detention. Asked for details on how the robbery kingpin was nabbed, another source confirmed that Adikwu had sneaked into a hotel (name withheld) around Niger/Muritala area of Ilorin on Monday night to enjoy himself. He led investigators from the Inspector General of Police (IGP) Special Intelligence Response Team (IRT) to two other members of his gang. Meanwhile, a visit to the command headquarters during the week indicated that security had been reinforced around the SARS office where some of the suspects are still being detained. Police commissioner for Kwara State, Aminu Pai Saleh, had on assumption of duty in the state revealed that hoteliers were assisting the police in tracking the robbers. The proprietor of a hotel where the armed robbers allegedly spent the night before the operation has been arraigned before an Ilorin Magistrate’s Court along with the hotel’s accountant, a receptionist, a room keeper and a club house operator as well as four lodgers who were staying in the hotel at the time the suspected robbers also allegedly lodged there.